Google Deleted contacts feature included in Gmail at the launch of the new interface Gmail earlier this year, because it works to create views feature more consistent and smoother connection as the company previously announced. 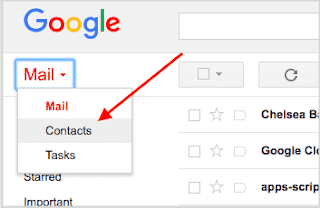 The Contacts feature in the old Gmail allows users to access their contacts by clicking the Settings icon in the upper-right corner of the UI. From now on, Gmail users can access their contacts via their web browser at contacts.google.com or through the apps list, as shown by the following image. Once you click the contacts icon from the apps list, this will direct you to the new Contacts interface, which includes many options, such as creating a new contact, viewing contacts that are constantly used, previewing, managing contacts, and other options. There are several ways to make a backup of your contacts on an Android phone , such that this copy is saved on your SIM card or on an external memory card but these cards are also damaged, lost and stolen, so it is not the most perfect way to save a backup of your contacts. So the best way is to save this backup on the Internet, where the Android operating system allows this feature through the synchronization of contacts with your account on Google within your Gmail page so you can restore this version at any time. Before you start backing up your contacts, you need to make sure your contacts are connected to the Gmail account you will use to store the backup. Once you synchronize with your Gmail account you will be able to browse your already synced contacts by clicking on the contacts icon in the application list from within Gmail.